A 1978 Ph.D. graduate in Higher Education Administration and Black Studies. 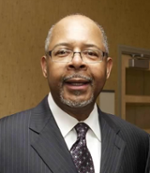 A book titled Advancing Equity and Diversity in Student Affairs is a Festschrift in honor of Melvin C. Terrell a graduate 1978 of Southern Illinois University—Carbondale where he received his Ph.D. in Higher Education Administration and Black Studies. The book edited by: Jerlando F. L. Jackson, University of Wisconsin‐Madison; LaVar J. Charleston, University of Wisconsin‐Madison; Cornelius Gilbert, Northern Illinois University is a volume in the series: Contemporary Perspectives on Access, Equity, and Achievement. Editor(s): Chance W. Lewis, University of North Carolina at Charlotte. Produced this Festschrift for a dual purpose: (a) highlight how student affairs has grown as a field of practice in response to the growth of student diversity on college campuses, and (b) honor the remarkable career of Melvin C. Terrell. As one of the unique contributions to higher education attributed to the United States, the practice of student affairs has played a significant role in supporting students as access to college has broadened. Proceeds from the purchase of this book go to the Melvin Cleveland Terrell Endowed Scholarship. The earnings from this scholarship will provide financial assistance to graduate students who qualify academically but who may not otherwise be able to attend due to financial hardship.